Sure, that fancy desk and chair you’re thinking of getting for your child’s bedroom seems like a good idea. But before rushing out to buy all the bells and whistles for a catalog-beautiful “dream” study space, remember the golden rule of designing the perfect area: Create it specifically with your child’s personality and study habits in mind. If he works best around people, set him up in the dining room, kitchen, or living room (for kids who sometimes prefer lying down to work, the couch doubles as a great alternate work space). If he’s easily distracted by clutter and noise, set up shop in a quiet, secluded space. The overall work surface should be your child’s waist height. When your child sits down — ideally at a chair that has a back and arm rests — his elbows should rest on the table without hunching, bent at an angle of about 90 degrees or more. If he’s not up high enough, add a pillow or folded towel to raise the seat. His feet should be resting flat on the floor and not dangling. If they are, put a foot rest or box underneath. To shoot for ergonomic perfection for a typical first grader, the chair should be around 12 inches high, the table at about 18 inches; by seventh grade, the chair should be around 14 inches high and the table 24 inches high. After middle school, aim for a chair that’s 16 inches high and desk that’s 25 inches high for girls or, for boys, a chair that’s 18 inches high and a desk that’s 27 inches high. If your home doesn’t have space for a permanent, dedicated homework space for each child, assemble what they’ll need for a mobile work space and designate where they’ll set it up each day — whether it’s the kitchen table, the living room coffee table, the family computer station. Place everything they’ll need to do homework (planners, markers, sticky notes, calendars, and Chromebooks included) in a container or box that’s easy to transport and can be tucked under the bed or into the closet when homework’s done and it’s time to clear the table for dinner. Is the TV on? Is an older sibling blasting music, or are younger ones squabbling? Is the dog barking and the bird squawking? Some kids require peace and quiet to focus. 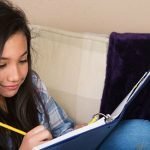 If you notice that your child gets easily distracted, or that you’re frequently asking family members to pipe down, think about relocating her study space — or moving the pets. Turn off the TV. Turn off or ignore all phones (cell and land line; during homework, kids aren’t allowed to answer unless a parent is calling). “Ugh! I can’t find the dictionary!” “Who took the glue stick?” To avoid these stress-filled moments — and needlessly wasting time hunting for missing items — duplicate a school supply list at home. (Here’s what you need for elementary, middle, and high school). Store everything in a central area. Shoe boxes do nicely to store pencils, pens, rulers, and scissors. Consider labeling big-ticket items like staplers, scissors, and rulers with a sticker that reads “Return to homework box.” That way, everything is easy to find, and nothing goes missing when your child needs it most. If there’s space, get your child in the habit of noting assignments on a calendar. If you don’t want to hang one on the wall, she might like a big desktop calendar. This is especially helpful for younger kids who are still mastering the fine art of keeping track of their homework. Your child’s workspace doesn’t need to be military-precision clean, but encourage her to put things away after finishing her assignments and keep the area in order. Things are less likely to get lost in the shuffle, and the area will be a tidy blank slate for the next time she sits down to do homework. Charity Ferreira is a senior editor at GreatSchools and the mom of a middle schooler. 5 things to say when your child says, "I hate reading!"